from the navigation menu in your Docs, Sheets, or Slides app, and you’ll be given the option to restore or permanently delete any files that you’ve trashed. Visit the Google Play Store to download the latest Docs, Sheets, and Slides apps for Android and check out the new functionality. 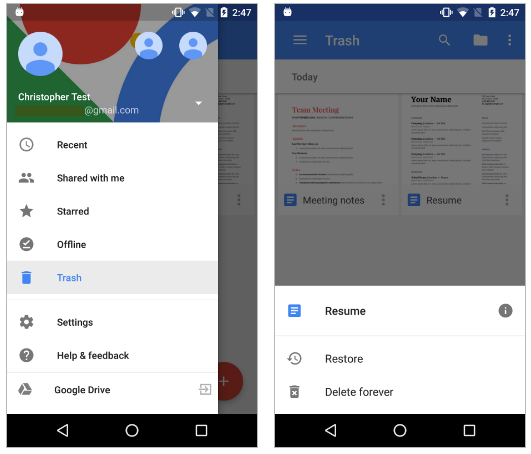 The newest versions of the Google Docs, Sheets, and Slides apps for Android make it possible to retrieve trashed files you unexpectedly need or accidentally delete. Simply select Trash from the navigation menu in your Docs, Sheets, or Slides app, and you’ll be given the option to restore or permanently delete any files that you’ve trashed.